Swanneck Pens present a revolution in ballpoint pen design, allowing left-handed students to write with ease. Swanneck Ltd are delighted to announce that their logic pen has now been launched into the UK education market after 7 years' research and development. 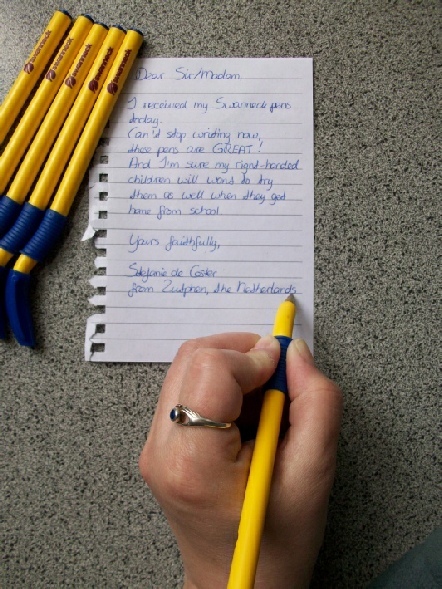 The Swanneck pen brings a logical solution to the world’s writing needs, whatever language you write. Whether it be ‘left to right’ in English, ‘right to left’ in Arabic, or ‘top to bottom’ in Chinese and Japanese. The pens represent a breakthrough in ballpoint pen design that's not only ergonomic, but looks great too. The writer is able to clearly see what they are writing without obscuring written text or letters, which is especially beneficial when a child is learning to write. Heather Hemmings is the founder of Swanneck Ltd and tells us more: “My daughter and myself are both left-handed, so we wanted to design and manufacture a pen that would be functional and elegant for children and adults to use." Smart Swanneck Pens are an elegantly simple solution to the left-handed writing needs that ultimately affects some 1 in 6 worldwide - a staggering 1 billion people. Up until now, many thought it would never disappear as writing left-handed with a standard pen can, quite literally, be a huge pain. Slowly formed, sloping letters, messy, smudged presentation and even physical discomfort are some of the issues found when researching into this area. People are led to think it's all part and parcel of left-hand writing, which often emerges when learning to write in childhood. All models in the Swanneck Pen range feature a design registered, unique, S-bend neck and grip area. The writer can hold the pen comfortably at a balanced angle and easily view all letters and words as they are written whilst adopting the correct Tripod grip. Not only do the pens transform the capabilities of left-hand writers, but the makers have also incorporated Biomaster Antimicrobial technology to their newest model to treat against the spread of MRSA, staphylococcus aureus and E.Coli. The writing pen can be one of the biggest sources of transmission regarding the spread of infection, and studies have shown that pens from health-care workers have tested positive for viruses and bacteria, including influenza, VRE, and MRSA. Swanneck pens are now available as brightly coloured ballpoints, packed in ten pen packs for schools and twin packs for retail. There is also a stylish aluminium boxed pen to give as a gift. The pens have already had lots of media attention on Sky One, BBC and ITV. Schools can receive a 20% discount by quoting 'Innovate My School' when ordering.